As luck would have it, I beheld an unlikely but well-timed prospect while scanning the mouth of Spa Creek from an old dock in Eastport, Maryland, on a recent morning that was suffused with warm summer light. Off to the west my test boat, a Krogen 44 Classic named Travellers, floated dreamily in a mooring field, with the waterfront of Annapolis behind her. To the east another Krogen, similar but seemingly much smaller, floated just as dreamily in the same field. 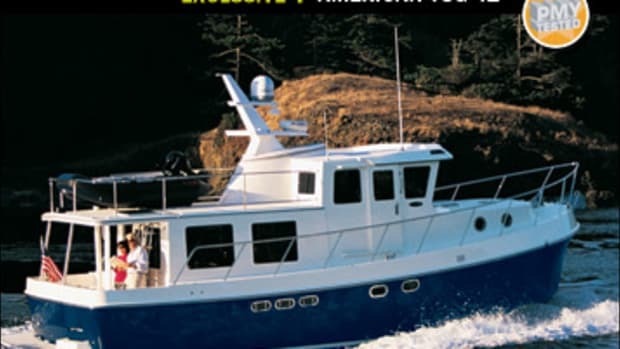 "Is the little one your 39-footer?" 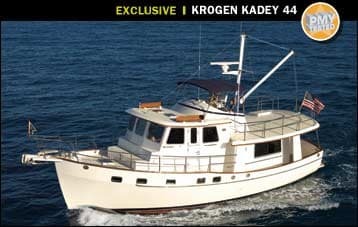 I asked Krogen&apos;s marketing and sales rep Larry Polster as we boarded the water taxi we&apos;d hired to take us out to the 44. He grabbed my test gear as I handed it down from the dock. "Nope," he replied, "that&apos;s the 42, the model the 44 replaces. She&apos;s two feet shorter and six inches narrower. Looks lots smaller, though, maybe because the 44&apos;s a wide-body version. Pushing out the port side makes a heck of a difference." Owners Lana and Greg Eaton welcomed us into their immense, back-porchy cockpit with the easy affability of genuine seafarers. Salty, resourceful souls, they&apos;d grown up together on one of the rocky little islands of Canada&apos;s maritime provinces, then spent much of their married life cruising the waters of North America, from the St. Lawrence to the Florida Keys, during vacations and holidays. Scenting retirement but still working, they were especially excited about their latest home away from home. She was a beauty. 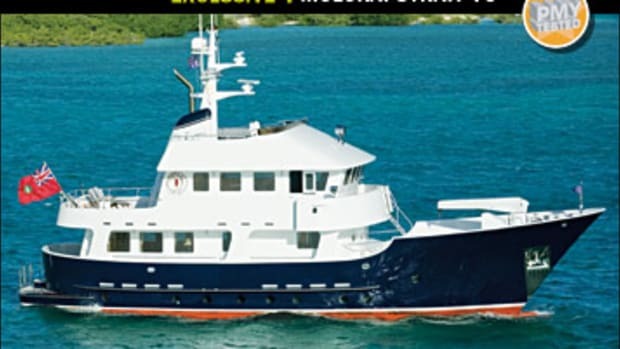 As the couple gave us the grand tour, I began tallying a raft of design- and engineering-related features I liked, starting with the interior layout which, in a general way at least, was virtually the same as the trusty old 42&apos;s, meaning there was a bottom-deck engine room, a top-deck wheelhouse, and a middle deck with a master stateroom forward, a starboard-side guest stateroom/"den" abaft it (opposite a head with separate shower stall), and a saloon and U-shape galley all the way aft. 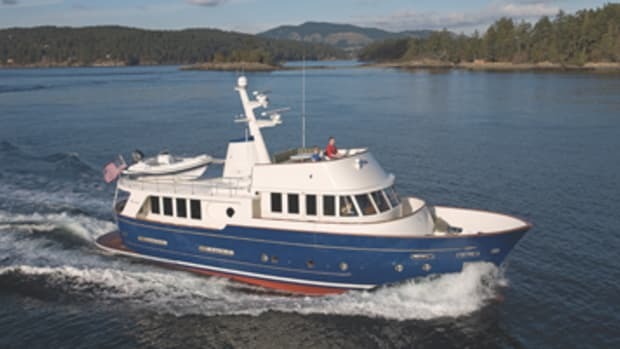 Our 44&apos;s extra length and widebody beam fostered some lead-takin&apos; upgrades within this envelope, however, including space for a comfy Pompanette helm chair in the wheelhouse and more than enough elbowroom in the cockpit for a dinner-party-size stowable teak dining table with chairs. 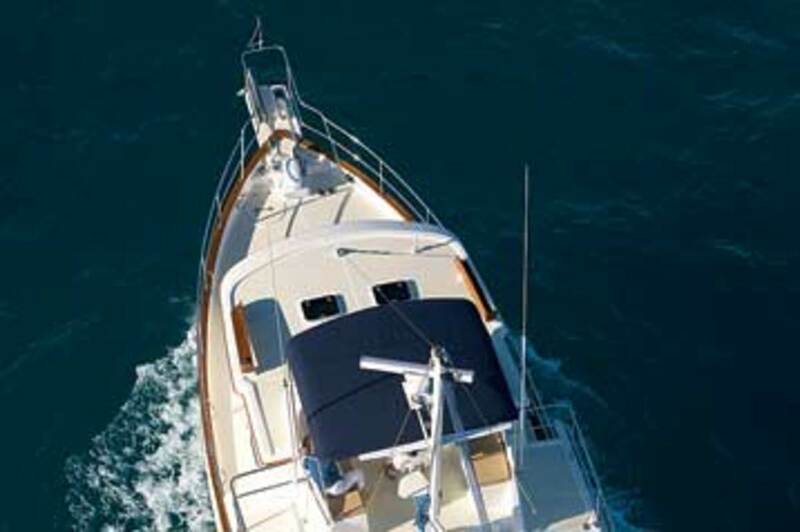 Without a doubt, the 42 was a great cruising couple&apos;s boat. But the 44&apos;s dang near perfect, in my opinion. 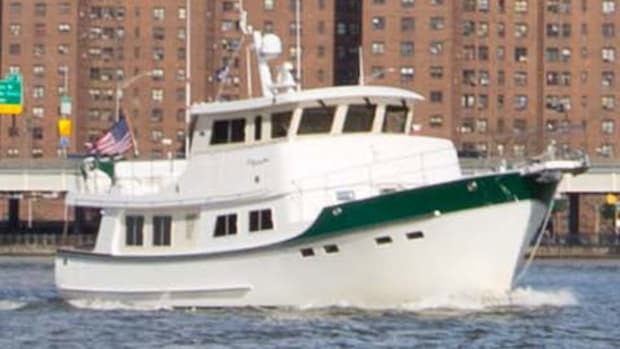 The fit and finish of Travellers was exemplary, thanks to Asia Harbor Yacht Builders of Taiwan, the same folks who began fabricating the 42 in the early 1980&apos;s and didn&apos;t stop until they&apos;d splashed more than 200 of them. 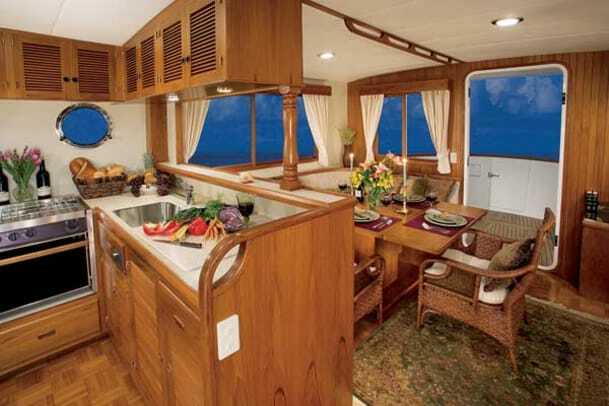 Inside, the look was mortise-and-tenon traditional, with a plethora of louvered, stile-and-rail doors on lockers and staterooms, all imbued with the warmth of hand-rubbed varnish. Outside, surfaces skinned with state-of-the-art Cook Composites and Polymers (CCP) gelcoat were flawless and creamy. "Lemme show you the engine room," Eaton enthused, stooping to turn the dogs on a Freeman watertight door in the den&apos;s after bulkhead. Well over six-foot tall, he fit through the opening well enough, proceeding forward on his hands and knees. Once we were inside, I did a double-take—the little 154-hp John Deere 6068TFM diesel looked positively waif-like in the brightly lit immensity of the place. Details were artisanally accomplished and logically organized, with electrical, fuel, plumbing, and other lines run exteriorly to facilitate maintenance and repair. 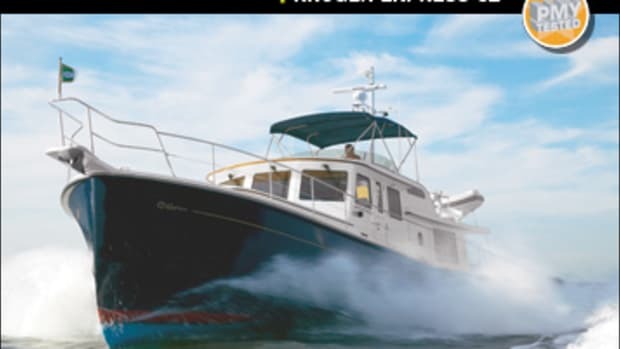 A fuel-polishing system caught my eye, along with a beefy, super-quiet HeadHunter Caliber variable-speed water pump, safety-enhancing duplex Racors, an easy-livin&apos; 3,000-watt Xantrex ProSine inverter/charger, and a whole slew of powerful 8D and 4D Lifeline AGM batteries. "This baby takes trawlers into the Twenty-First Century," I concluded as we exited and went topside to crank &apos;er up and slip our mooring. I discovered three things while sea trialing the 44 in 20 to 30 feet of water near Thomas Shoal Lighthouse, a few miles southeast of the Annapolis Coast Guard station. 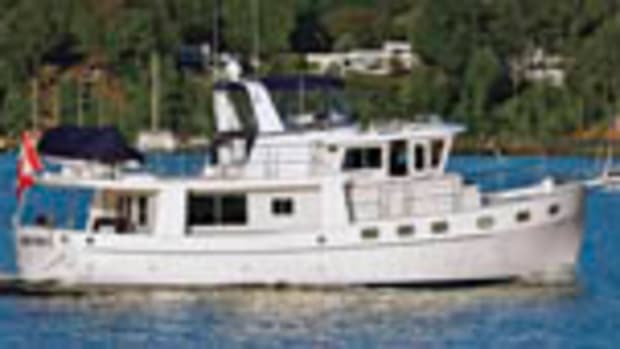 The first was pure nuts and bolts: Thanks to the wonders of modern technology, the 44&apos;s even more solid and seamlessly built than the 42, with Knytex mats, pricey vinylester resins, a one-piece PVC-foam-cored superstructure (with a one-piece boat deck/flying bridge/pilothouse molding on top), teak decks secured with epoxy instead of screws, and a hull-to-deck joint fastened with gutsy polyurethane adhesive. I could literally feel the heft and muscularity of the 44 as she rambled through the waves. The second was real-world-cruising-related: Operating the 44 was an absolute joy. 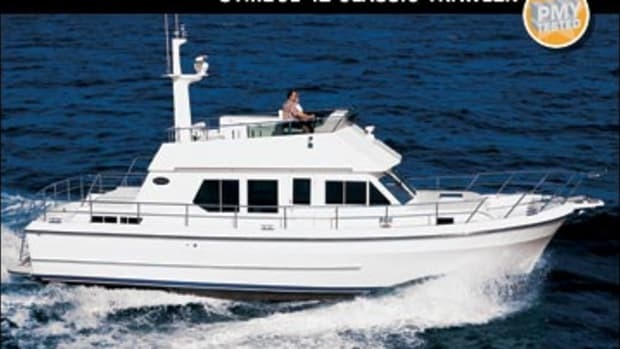 Visibility was excellent from both the upper and lower helms, Hynautic hydraulic steering was smooth, tracking was arrow-straight, instruments were instantly readable, and the rolling motion of the unstabilized boat was both easy and seakindly. Some vessels are tiring to operate long-term, even with stabilizers. The 44&apos;s relaxin&apos;! And the third? Due to scheduling and other concerns, the test of our 44 was a bit hurried and, as a result, perhaps somewhat flawed. 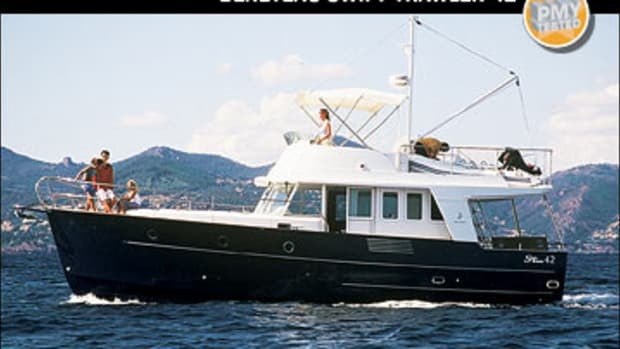 Because the Eatons graciously made their lives and their boat fit a workable agenda for PMY, they did not have time to have her bottom cleaned, a detail that likely shaved a knot or so off our speeds and significantly affected the range calculations Krogen touts: 4,450 nautical miles at 6 knots, 3,000 nautical miles at 7 knots, 1,900 nautical miles at 8 knots, and 1,250 nautical miles at 9 knots. Nevertheless, even a brief perusal of the data shown here is pretty darn convincing—with fuel costs skyrocketing, the synergistic combination of a modern, low-horsepower powerplant like the John Deere 6068TFM with an old-school, full-displacement hull form like the Krogen 44&apos;s is likely to play an increasingly important role in yachting&apos;s future. 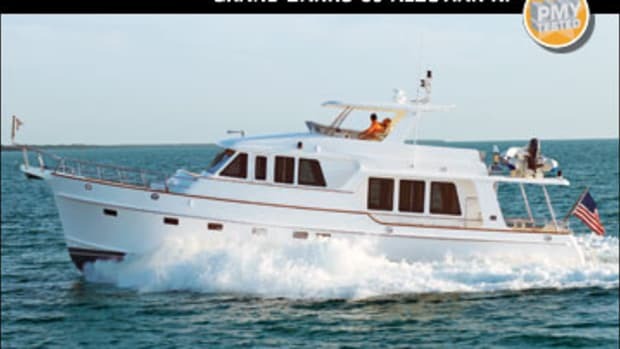 In fact, based on my recent experiences onboard, I&apos;m betting the traditionally styled, contemporarily constructed 44 will eventually outsell the venerable 42 and then just keep right on chuggin&apos; along.